Hillary Clinton had the perfect debate response to Anderson Cooper's email bait. 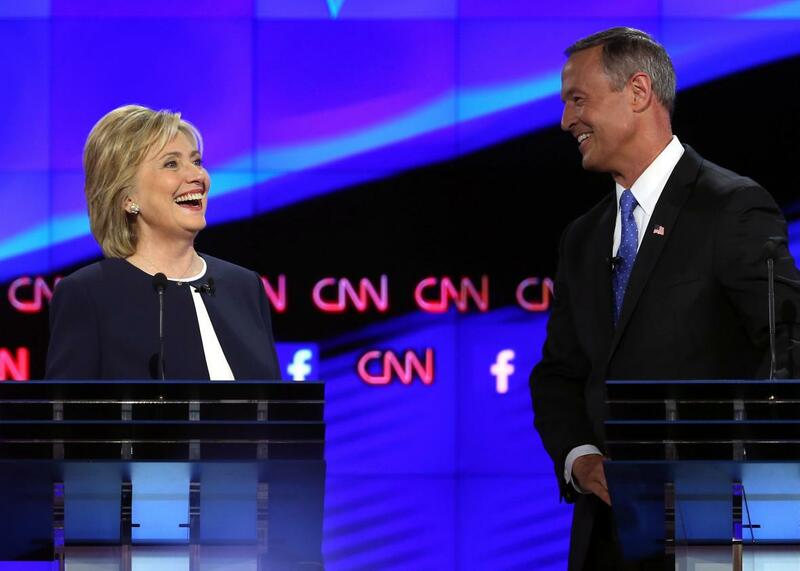 Hillary Clinton and Martin O’Malley at the Democratic presidential debate on Oct. 13, 2015, in Las Vegas. At Tuesday night’s Democratic debate, Hillary Clinton was taken to task for her private email account—a scandal whose protracted aftermath she says has cost taxpayers $4.5 million. And, as Slate’s Josh Voorhees predicted, much as he tried, moderator Anderson Cooper couldn’t get Clinton off her script. She pooh-poohed the Republican investigation as a partisan tactic to torpedo her presidential bid and gain points with conservatives and suggested that America move on to more important issues. Sen. Bernie Sanders agreed. “I think the secretary is right. And that is that the American people are sick and tired of hearing about your damn emails,” he said, shaking Clinton’s hand in the debate’s most convivial moment. The crowd ate it up. But Cooper wouldn’t let Clinton get off so easy. Cooper asked Clinton if she wanted to respond.